Durable stylish padding makes this chair very comfortable. A great idea for hanging on the patio, a sturdy branch or a yacht. The Macrame Hanging Chair is beautifully hand crafted and constructed to the highest quality. Enjoy your creature comforts on this luxurious hammock chair - perfect for the beach, the deck or patio. Attach chair to a sturdy beam or tree, or alternatively you can attach it to our Steel Chair Stand which makes it portable. Please view accessories or Stands & Frames for attachment options for your this hammock chair. 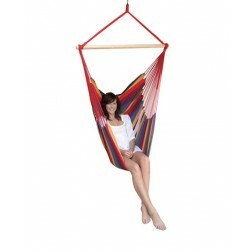 We highly recommend using a hammock spring pack when hanging this hammock from a solid beam, branch or stand. This will take some of the pressure off the chair strings, prolonging the life of the chair significantly.